Some of the most usual small-scale erosional landscapes in the West are found in quite unexpected places, surrounded by relatively large areas of featureless land, such as Cathedral Gorge in Nevada or John Day Fossil Beds in Oregon. 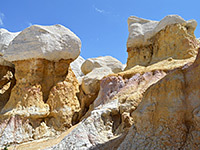 Another such location is the Paint Mines of central Colorado, near Calhan, where several branches of a minor ravine have eroded to expose brightly colored, clayish rocks, in shades of yellow, red and grey, and white, outcrops which were once mined by Native Americans for pigments and pottery. The area is protected as an Interpretive Park, managed by El Paso County; entry is free, and facilities comprise overlooks, a picnic area and four miles of trails. The park is situated just south of Calhan along US 24, near the west edge of the great plains of eastern Colorado - within sight of the Rocky Mountains but surrounded in all directions by short grass prairie and low, undulating hills, with very little habitation. Colorado Springs is 35 miles southwest. The branched drainage that has exposed the multicolored clays is the upper end of an unnamed tributary of Big Sandy Creek, and it has formed several shallow ravines along the north edge of the Holcomb Hills, a flat-topped range that is mostly lined by grassy slopes - only in this one location does the bedrock exhibit great color range. The outcrops are found either side of Paint Mine Road, 2 miles south of Calhan, but all trails are to the east. The most extensive area is around the uppermost part of the largest ravine, viewed from above from West Overlook, and close-up by a trail along the gully, which downstream of the colorful section passes two of the park's four interpretive sites, and links with a loop from the main entrance, a little way north. Two other trails head further east, to two smaller outcrops, and connect with a short spur from the south entrance. Walking off-trail is not permitted, in order to preserve the formations. 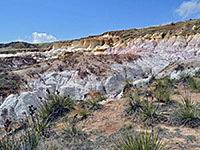 The rocks at the Paint Mines are interlayered shale and clay with embedded selenite (gypsum) and jasper, heavily stained by iron oxide and topped by a more resistant layer of cross-bedded sandstone, which forms the white caprocks on some of the hoodoos. All is from the Dawson Arkose, an early Paleocene formation that extends north towards Denver. The colors are enhanced after rainfall, though wet weather can make the trails muddy and sticky. Excavations have revealed arrowheads, spear tips and petrified wood tools, evidence of Native American activity here many centuries ago; the earliest habitation dates from around 7000 BC.